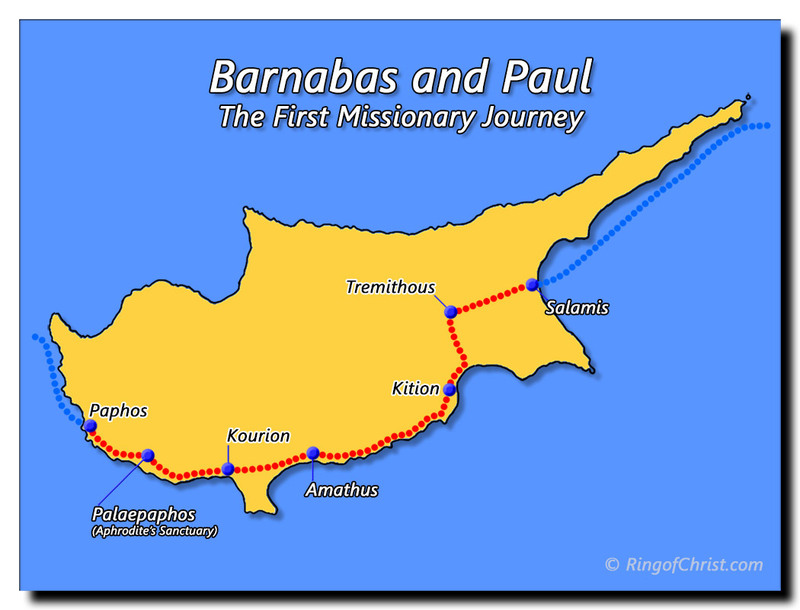 Today we start the first of Saul/Paul’s official missionary journeys. He, Barnabas and John Mark are sent off by the Holy Spirit. 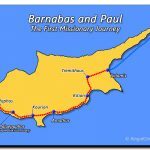 This is not Barnabas’s first missionary journey as he was the one to first go to Antioch. John Mark is new to this scene and is coming along as an assistant. When this trio came into a new area the first place they went was to the synagogues of the Jews. If they weren’t received there then they were free to move onto the Gentile population in the area. We are told “they went down to Seleucia, and from there they sailed to Cyprus” (verse). They proclaimed the word of God in Salamis and worked their way to Paphos. I have no idea how long this took. It is 90 miles between the two mentioned locations. I’m sure there were many memorable experiences along the way but this one stuck out to our travelers and our writer. This is the first place that our author, Luke, refers to Saul by his Roman name, Paul. Our trio came across the highest ranking official in this Roman province. His name was Sergius Paulus and he wanted to hear the gospel from Paul and Barnabas. He specifically summoned them so he could hear what they had to say. I’m wondering if this audience was what first opened the door for Paul into the courts of the Romans. This is the first time I know of where he spoke to anyone in authority in the Roman government. The first bricks laid in his road to Caesar. True to form, Satan tries to stop God’s work. This time he uses “a Jewish false prophet named Bar-Jesus.” He was also a magician. For some reason he was with Sergius Paulus. I don’t know if he had been consulting him or was part of his regular court. Bar-Jesus/Elymas tried his best to keep our Roman official from hearing God’s message of salvation. Paul, through the Holy Spirit, put a stop to it. This was no “soft answer” but a firm rebuke of everything Satan had been attempting. “You son of the devil, you enemy of all righteousness, full of all deceit and villainy, will you not stop making crooked the straight paths of the Lord?” (verse 10). Paul called him on EVERY offense he had been using, probably from the beginning of his “service” as a prophet/magician. His powers were NOT from God and Paul made sure that everyone present knew their origin. In the very next breath Paul proclaims punishment on him from the Lord. This served a couple of purposes. The first was as a sign for Sergius Paulus. He was blown away when he saw Bar-Jesus immediately go blind. This added credibility to what Paul and Barnabas had been teaching. Satan was effectively silenced in that same moment and God’s word rang loud and clear. One of the main things is should have done was to wake Bar-Jesus up to the power of God, but it didn’t appear to. We are not told he repented of his ways or even asked Paul and Barnabas to help him. “He went about seeking people to lead him by the hand” (verse 11). No change in his beliefs or allegiances are noted. I wonder if he ever accepted the truth. Did he ever turn to Jesus for his freedom from Satan? Father God, You knew exactly what lay ahead for Paul, Barnabas and John Mark. You were laying the stones of their paths one at a time. You brought them to where they needed to be and gave them the words and works to use. You don’t leave us hanging when we act on what You have called us to. The times I feel like I have been left alone to forge on is when I’ve stopped waiting for You to lay the ground work. Paul could have rushed headlong into the heart of Rome but You weren’t ready for him to be there yet. HE wasn’t ready to be there either. He had growing to do and You made sure to help him with it first. I’m not ready to walk some of the roads You have for me yet either. I don’t know what they will eventually be or when You will bring me to them but I KNOW You will prepare me each step of the way. When the time is right, YOU will let me know. I wonder if Paul had any inkling that he would one day stand before Caesar and proclaim Your Kingdom. One step at a time.